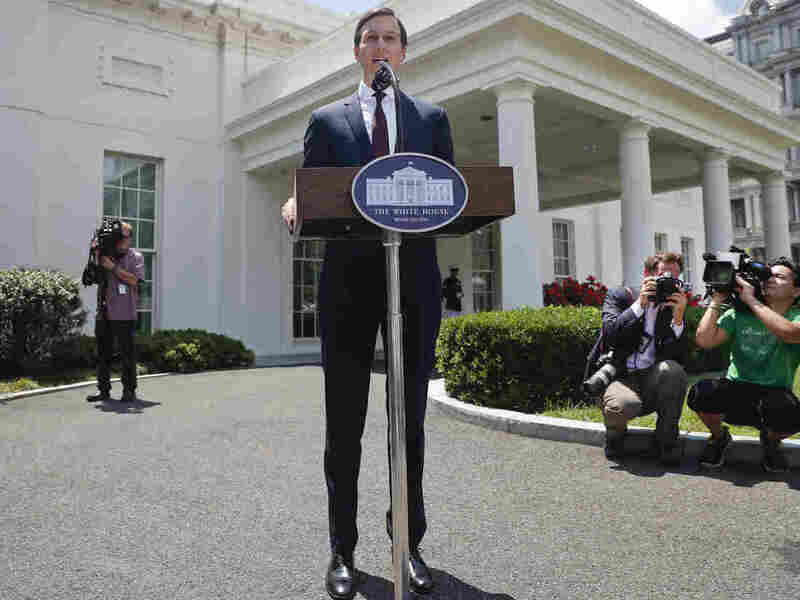 Trump Son-In-Law Kushner To Regain Top Clearance Following Mueller Interview White House senior adviser Jared Kushner met with the special counsel's office for seven or eight hours and may now be out of the woods legally — or on his way. White House senior adviser Jared Kushner denied any wrongdoing in the Russia case last July, and the administration is now restoring his top-level security clearance. Kushner met with Justice Department investigators for seven or eight hours in his second interview in the Russia investigation, the person said. The session covered "all the appropriate topics," including the campaign, the presidential transition and post-inauguration events such as the firing of FBI Director James Comey. Kushner's business and financial dealings did not come up either in his April interview with the special counsel's office or in an earlier one last November that mostly focused on former national security adviser Mike Flynn, the person said. The developments appeared to be a positive turn for Kushner. One lawyer who regularly represents government employees in security clearance matters said the White House's decision about Kushner's clearance suggested he may be escaping the cloud from the Russia imbroglio. "Certainly if I were Jared Kushner, I would be breathing a sigh of relief and sleeping easier tonight," said national security attorney Mark Zaid. "The favorable adjudication is not dispositive that he's out of the crosshairs," Zaid said. "But it's certainly reasonable to believe if there were a significant criminal problem, the special counsel's office would have given the intelligence community a heads-up to withhold the favorable adjudication." Kushner's clearance was downgraded in February as part of a broader effort within the White House to impose stricter requirements following the resignation of then-staff secretary Rob Porter. Porter and others, as it then emerged, had been working in sensitive jobs with tentative clearances. Trump attorney Rudy Giuliani told NPR on Wednesday that he and Trump were not worried about Kushner's meeting with the special counsel's office. "They can spend all the time they want with Jared. He's got no knowledge of Russian collusion of any kind," Giuliani said. Kushner, who is married to Trump's daughter Ivanka, was a top player in the 2016 Trump campaign and had several contacts that year as the Russian government launched a wave of active measures against the U.S. election. In June 2016, Kushner joined his brother-in-law Donald Trump Jr. and the Trump campaign's then-chairman, Paul Manafort, for a meeting in Trump Tower with a delegation of Russians. Emails to Trump Jr. described an offer of help to the campaign from the Russian government, although the tip that Kushner, Trump Jr. and Manafort are believed to have gotten was not the potent dirt they were expecting on Hillary Clinton. Kushner was later present at an event also attended by then-Sen. Jeff Sessions, an adviser to the campaign, and Russia's then-ambassador to the United States. After Inauguration Day, Kushner and Flynn met with the ambassador, and then Kushner later met with the head of a Russian state-controlled bank. Kushner told congressional investigators last summer that he wasn't aware of any conspiracy between Trump campaign aides and Russia's attack on the election and that he had done nothing wrong. "I am very grateful for the opportunity to set the record straight," he said then. "I also have tried to provide context for my role in the campaign, and I am proud of the candidate that we supported, of the campaign that we ran, and the victory that we achieved."